This story starts somewhere around 2000. Whenever it was it was fairly early in the shops history. I got a call from my good friend Jeff Chonis. He’s been a huge influence in my career and my life. Jeff has been Ringo’s Starr’s tech for around 25 years and has worked with dozens of the top drummers of our time. Ringo often refers to him as the “World’s Greatest Drum Tech”. More about Jeff later. I could write several entries just about him. Ringo has asked him to find a drum set made in the year he was born, 1940 and wanted the same for his son Jason born in 1967. Ringo wanted Ludwigs. Jason wanted Gretschs. I’d helped Jeff find a few other hard to find drum items previously so he knew I would be all over the chance to find Ringo and his son drum sets. I started scouring all my usual leads trying to turn something up with out any luck. 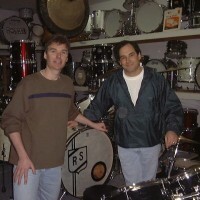 Speaking of luck…about a week after our initial phone call a guy comes in looking for a new Mapex set. He has his old drums in his car and want’s to trade them in. We go out to the car and there’s this spectacular 1940 Ludwig 24,13,16 and a matching 6.5×14 snare all in beautiful white marine pearl. My drum karma strikes again! The guy was pretty amazed at how much I gave him on trade (there was no way in the world I was going to let him leave with those drums!!). The bass drum had a crest with the drummers initials on it made with these press on vinyl letters. I got the idea to personalize the kit for Ringo and went to an office supply store and got some new press on letters. It was pretty easy to change the letters to RS. We took some photos (which we took to the 1 hour processing shop, man have things changed!) got the prints and put them in the mail. It would be a few days before Ringo got the pics and could call us back to let us know what he thought. In the meantime our good friend Jon “Bermuda” Schwartz from Wierd Al Yankovick’s band stopped by while on tour with Wierd Al. Bermuda is an extraordinary drummer. He doesn’t get the cred he deserves playing in what a lot of people would consider a novelty band. Bermuda has been with Wierd Al since day one. The truth is that the Wierd Al show is an extremely complex show with hundreds of cues, sound effects, triggers and bizarre twists packed into the show. The show is so complicated that Bermuda has never missed a show for the simple fact that there is no other person on this planet that could learn the whole show. Bermuda is a huge vintage drum fan and a huge Beatles fan so he was excited as we were to see the drums that could be Ringo’s. We heard from Ringo a few days later. He loved the set and wanted them. What really put him over the top was the RS crest on the bass drum. I was ECSTATIC. I am also a huge Beatle fan and could hardly believe that I’d just found a set of drums for Ringo Starr.